collection. Works from the Etzold Collection will demonstrate their current contemporariness in three episodes over a period of three years. The first episode focused on works by the Constructivist avant-garde in the 1920s and the return of Constructivism since the 1960s. The second episode sheds light on the collection’s compilation of computer graphics and their algorithms. Early computer graphics images by Herbert W. Franke, Manfred Mohr, Frieder Nake and Georg Nees, digitally inspired compositions by K.O. 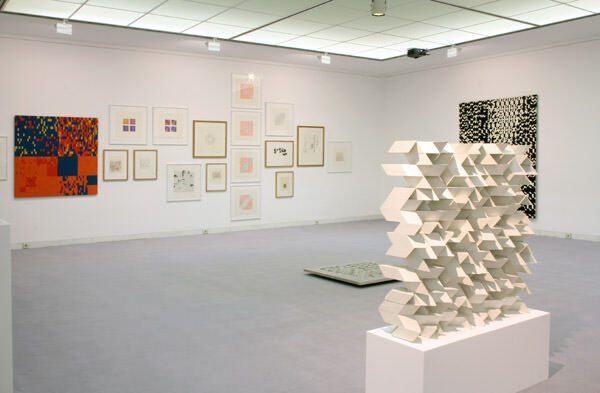 Götz, vibrating pictures by François Morellet, Jesús Rafael Soto and Victor Vasarely show the vast array of positions exploring the relationship between drawn gesture and programmed machine. The topic of computer graphics will be extended to the present, and supplemented for the duration of the show with a supporting program that includes lectures by experts and artists. There is also a special art education program for school classes, children and young people and wide variety of interest groups.